The products or methods you’re currently using aren’t breaking down the enzymes in your cat’s urine. You need an enzyme-based cleaner formulated for cats. Nothing else will remove the cause of the odor or break down the components in your cat’s urine once it’s dried. According to Catster, We’ll keep the science lesson brief. When you understand the compounds that makeup cat urine, you’ll understand why it’s difficult to clean and remove the scent and stain. Your first thought might be to blame pheromones, bacteria, or so on for the odor and discoloration in your carpet. Most of the urine breaks down the moment the pee spot dries or if you use a simple household cleaner with a neutralizing agent, such as peroxide or baking soda. Yet you’ve likely noticed that the strong ammonia-like odor can linger after the stain itself is gone. The pungent smell also worsens or reappears with humid conditions. You can blame the uric acid in your cat’s pee. It attaches itself to whatever surface it touches, like your carpet fibers or padding. Uric acid’s bond can linger for up to seven years after your cat initially pees on the carpet too. Only an enzyme cleaner specifically made to tackle cat urine will destroy the bond and possibly halt further peeing in that place too. The type of carpeting, rug pile, and underlayment do matter. The thicker your carpet, the more applications it can take to remedy the stain and smell. This is why it’s important to fully saturate the area with your cleaning solution because your cat’s pee most likely absorbed into the padding. It’s also possible that it absorbed past the pad and into your floor underlayment. If your flooring doesn’t have a protective barrier between the pad and wood, you might need to replace that to rid your home of the smell. The color of your carpet can work against you too as lighter hues show the deep yellow spot more than a darker one does. Aside from replacing your carpets, you’ll need to use a cleaning solution and method that restores the original color without fading or ruining your carpets further. Always test a spot first. Pick a non-conspicuous area such as a closet and spray your chosen carpet cleaning solution there first. Once it’s dried, check for changes in color and texture. If you happen to have an extra carpet swatch, use that instead and follow the same steps. Chances are your cat has used your carpet before as its litter box. If your house had a previous owner with pets, it’s possible their animal marked or had an accident too. 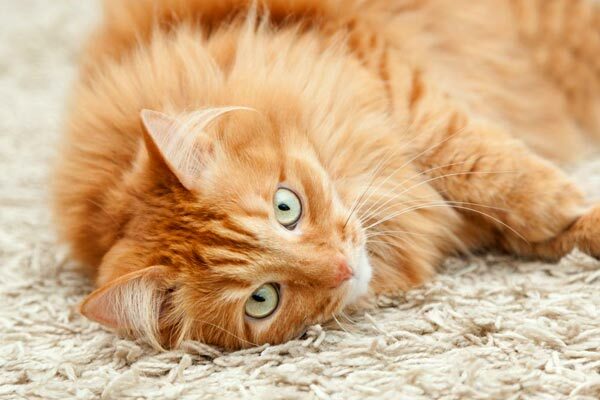 Unless you have brand new carpets, just moved in, or never owned a pet before, you’ll have no way of knowing if a dried spot came from your cat. However, you do still need to address older spots even if you can’t see them. Your first step is to locate the stains in your house. Stepping into a cold, wet pee spot is one way, but what about dried old spots that you can’t see? A black light, such as this one from TaoTronics, allows you to see dried urine. Be prepared to find more pee spots, but understand a black light illuminates human and other animal fluids too. Go through your darkened house room by room with the black light. Strip down beds of linens, inspect mattresses, and upholstered furniture. Mark any stains you discover. Be sure to check under beds, closets, and anywhere your cat has access to. Keep in mind that rooms you make off-limits to your cat might have been accessible previously to other animals. 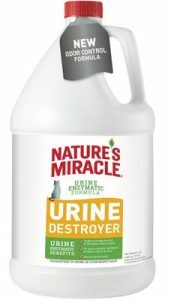 Nature’s Miracle Just For Cats is a decent one for multi-cat households or multiple urine spots. Don’t use general pet kinds. Make sure it’s formulated and safe for cats. BUBBAS Super Strength Commercial Enzyme Cleaner is an industrial strength formula is also a top choice enzyme cleaner. Mix and store whichever cleaner you choose according to the instructions. This is important if it’s a concentrate that needs to be diluted. You might believe it’s stronger without extra water, but you can damage your carpets or have it not properly work. Make sure your animals aren’t in the room when using cleaners. Cats lack many digestive enzymes and can become ill if they encounter cleaners before they’ve dried. Liberally douse the dried stain. Do not lightly spray. You must penetrate the carpet and pad to remove odor. If you fail to remove the cat’s scent, they’re likely to pee there again. Repeat as necessary until spot and scent disappear. If the spot is still damp, be sure to blot the area with paper towels before saturating the carpet. Don’t be in a rush. It can take several days to fully remove a stain. Use fans to aid the drying. If you’re in a humid area, consider using DampRid, which also helps with odor temporarily, or run a dehumidifier. Once the spot dries, mark the area with painter’s tape. Check back and see if your cat pees there again. Do this with every spot you find and clean. It might not seem like a big deal, but where your cat pees, the frequency, and if they keep returning can give you and your vet clues as to why your cat isn’t using its litter box. These natural cleaners don’t contain harmful chemicals, but the majority of them won’t remove uric acid. Remember, that causes the telltale scent associated with a dirty litter box and cat pee. However, these formulas can work well at removing the actual stain and covering up the odor, albeit temporarily. Angry Orange Pet Odor Eliminator uses the power of orange oil instead of harsh chemicals to tackle your cat odors and stains. Many pet owners swear by this cleaner, but cats can be finicky about scents. In some cases, the odor could be a deterrent from re-marking the cleaned spot. Other cats might be more inclined to put their scent on top it. Homemade pet cleaning solution recipes exist online. The majority of these can’t break down or neutralize all urine enzymes. Some recipes call for essential oils too, which pose serious health hazards and possible death for cats according to the Pet Poison Helpline. Avoid diffusing or using these essential oils around your cat. If your room or area is well ventilated or they’re in another room, you can use them. Most DIY cleaners provide a temporary solution, and they can be helpful for another household/pet-related messes. Adding rosemary or cedarwood essential oil might be ideal because it has antibacterial and purifying properties. It’s also safe to use around cats. Don’t use any essential oil directly on your cat or in an electronic diffuser. Mix equal parts water and vinegar in a spray bottle. Add essential oil and shake. Note: You might have to repeat this process weekly until the stain and odor disappear. You will also need to remove animals from the room. This method only addresses the colored stain your cat left on the carpet. Sprinkle baking soda on the stain. Let sit for 10-15 minutes. Pour enough white vinegar over the stain. Let it fizz and bubble. Mix two drops dishwashing soap with 2 tablespoons hydrogen peroxide. Cover the stain with the new mixture. Quickly scrub it in and blot. If it sits too long, you might discolor your carpet. After 24 hours, use an enzyme cleaner or odor will return. One mistake people can make with dried urine is to steam clean their carpets. With stains and smell, this cleaning method will set it in. If you’ve already done this, you need to replace your carpet and pad. No amount of cleaning will remove it. Don’t use ammonia-based cleaners. The scent is too close to a feline’s scent. Your cat might sense another cat’s presence and re-mark the spot. It can also lead to them spraying in other areas of the house. Don’t punish or scold your cat for marking. By the time you find a dried stain, your cat’s likely forgotten they used that spot as their bathroom. Felines pee outside of the litter box for a reason. It could be stress related, due to a medical problem, or their basic nature. The latter is especially true if you haven’t spayed or neutered your cat. The last step anyone wants to take is ripping out their carpets. As mentioned earlier, sometimes, it’s the only option. This can happen when a cat continuously pees in one spot or room. Carpet padding, underlayment, and the subfloor see irreparable damage. 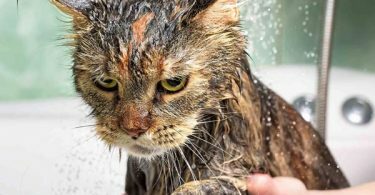 Most cat owners won’t face this issue if they quickly find their cat’s pee areas and address the underlying issue causing the accidents. Why Does Your Cat Pee on the Carpet? As stated above, your cat likely has a reason for not using their litter box. Felines are more finicky than owners tend to realize when it comes to their litter box, according to PetMD. They also don’t have a voice to tell you when something isn’t right. If you notice old stains or new stains, please take your cat to the vet before attempting to diagnose them or ignoring the behavior. Once you rule out medical reasons, you can move down the list to see if something else in your household is affecting your cat. The following video from Jackson Galaxy, best known from Animal Planet’s My Cat From Hell, provides expert tips on how to spot a reoccurring or underlying problem with your cat that is using your carpet and furniture instead of their litter box. He raises excellent points in the video. Something completely unrelated to your cat’s litter box can cause them to act out, such as a domestic spat, and one way your cat will try to get your attention is to not use their litter box. As Jackson Galaxy also states, it’s a good practice to keep a log or journal of where and when your cat pees (or poops) outside of the litter box. Noting stress-causing changes can also be beneficial to you and your vet. This includes jotting notes on location and frequency. Jackson Galaxy provides more expert tips that will help your cat use the litter box instead of your carpet. Keep in mind, these tips are for after you’ve ruled out a medical problem. 1. Have at least one box per cat in your household, plus one extra. You have three cats; you should have four litter boxes and so forth. 2. Place the litter boxes throughout your house. They should be socially important to your cat, meaning they’re in areas your cat hangs around. Don’t clump them together in one or two rooms. If you have multiple floors, you need a litter box on each floor regardless of how many cats you have. 3. Your cat doesn’t care about privacy. Hooded and covered litter boxes are for owners. 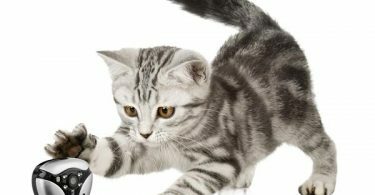 Don’t believe the marketing hype and believe your cat wants or needs it. It could be one reason why your cat doesn’t want to use the litter box. 4. Your air freshener and deodorizers might drive cats away from litter boxes and lead them to your carpet. If you keep on top of your litter boxes daily, you don’t need to use any added scents to mask the odor. 5. Use unscented litter if possible. You should avoid adding anything to your cat’s litter too, including baking soda. Perfumes and fragrances placed too close to the litter box can deter your cat, and they can harm your feline too. 6. If you have multiple stories, make sure you’ve placed a litter box on each floor. Sometimes your cat can’t make it downstairs in time, and this can cause them to create their own place. 7. You likely use one style of the litter box in your household. Experiment with different styles to see if that is part of the issue. Some owners have excellent results using puppy training pads. These can also help save your carpets while you’re diagnosing why your cat isn’t using their box. Remember those X’s you marked areas with? You can place the pads down in those areas. Pick them up and toss them once they’re soiled. For a greener alternative, try these reusable pee pads instead from PUPWHIZ. While it’s not the same as an actual litter box, it might be what your cat needs. If you own cats, keep a good enzyme cleaner on hand. It makes quick work of most urine stains and ensures you rid your carpets of the scent too. Don’t forget to have your kitty checked over by a vet. Whether they peed once or ten times, always rule out medical conditions first. 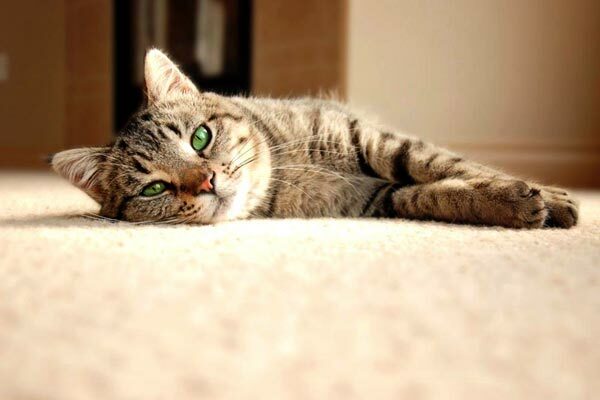 Take one step at a time to prevent further urinating outside the litter box, and come back to these helpful tips to hasten your cleaning time with tried and true methods to keep your carpets in good shape while you diagnose your cat’s issues.